Read about the latest sports tech news, innovations, ideas and products that impact players, fans and the sports industry overall at SportTechie.com. 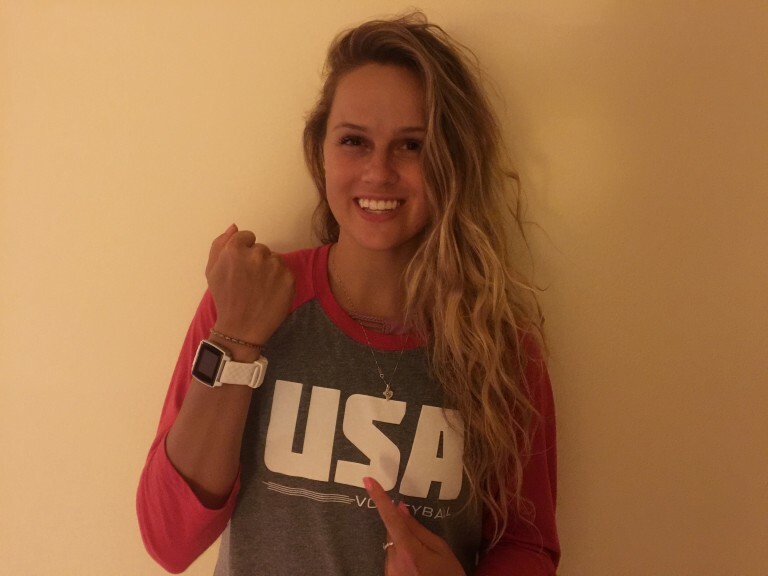 Professional and Team USA volleyball player Kelsey Robinson is documenting how she is using technology on her journey to the 2016 Rio Olympics. You can follow her on Twitter at @Krobin32. HONG KONG — It’s 9 a.m. in Hong Kong. I’m looking out my hotel window, overlooking a harbor surrounded by high rises. It would look like a scene from a movie, except I’ve been up for 15 hours forcing myself to adjust to the time change so I don’t face-plant or get hit by a volleyball at practice later today. Instagram, Twitter, Pinterest and other social media outlets may have you convinced that the life of a professional athlete is glamorous, but I can assure you it’s not all fun and games! It’s mostly jet lag and games. The USA volleyball team is partaking in the Grand Prix before heading to Rio. This event happens before every major tournament so we can tune up for the spotlight. These matches take us to a different country every week for four to five weeks. We fly from the U.S. to Ankara, Turkey or Sao Paulo, Brazil to Kalingrad, Russia. New countries, new time zones, all in a month. But time zones don’t present the only obstacle. In China, we can’t eat the meat because of concerns about what chemicals animals are exposed to. In other countries, the Wifi doesn’t work—and what’s the point of being in a new country if you can’t use a new Snapchat geotag? It’s no secret that an athlete’s best weapon is their body and their competitive mindset. You have to commit yourself to being in peak shape to perform your best, and the longer you can keep your body in shape and healthy, the longer you can play the game. Working out and eating right certainly help, but when outside factors (like traveling from Los Angeles to Hong Kong to Houston to Thailand) come into play, it may come as a surprise that new technology plays a vital role in keeping us sharp. The USA team has had the privilege to test out a bunch of emerging technology to increase our performance, but one of my favorites so far has been the Basis Peak, a watch the team was given last year. The watch is simple in design and usability. The interface has three main screens: the first shows your time and heart rate, the second shows calories and steps taken and the third shows your stats during a workout. It also syncs with my phone, which then shares information of how long and how well you slept. This is such a huge advantage for our team to get feedback on how our sleep was on the plane, the night we arrive and the nights to follow while in a new country. With the stats the watch provides, I can test, track and eliminate certain habits that may be negatively affecting my sleep, like staying up and binging on Netflix shows or sipping that afternoon coffee. This information is vital to my adjustment and my performance. It allows me to be at my best by the end of the week, whether in Thailand or flying across the ocean to Dubai. I can maintain a performance level throughout a month-long tournament with the help of the Basis Peak. But if you want to know the best part about all the travel, it’s the spread they provide for our meals. Good thing my Basis Peak can tell me the calories I’ve burned on the way to dessert station!